I have blogged about Chitika Premium but I am going to promote this one more time. Note that I don’t get any referral fees from it but I am telling you because I like it. As you know, Google Adsense does not allow us to place the ad under our title, just before our post. That is the best location to place ads because I notice the click through rate is high. So, what you can do with the space is to put a Chitika Premium ad. 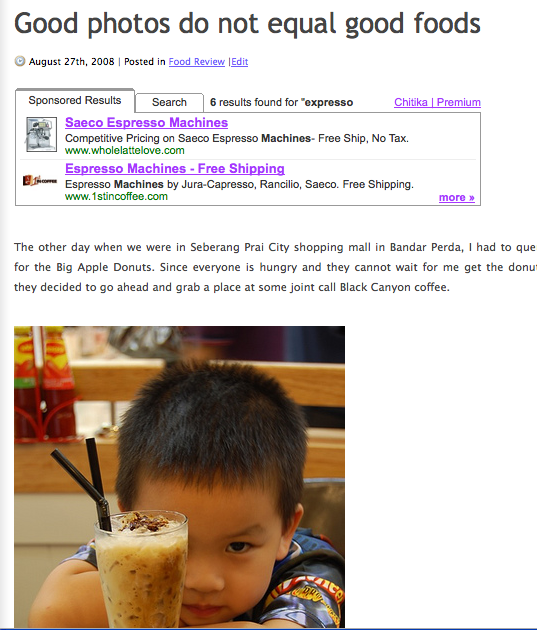 Here’s an example of my food blog’s ad. I don’t see the ads because it collapse into nothing if the visitors are not from USA. So, it is very neat. Try to make money with Chitika, do sign up and take a test run. Don’t waste prime real estate like the space under your blog title. Do read up the earlier posts on Chitika. They can be found here under Chitika category. Wait, why doesn’t Adsense allow you to place it between title and body? Hi, I like your blog and I am always interested in learning about new ways to make money with my blogs, so I am going to go ahead and subscribe to your feed and keep an eye on your suggestions. Thanks a lot! i already try chitika premium. But its not support our country. But if you get many traffic from us, its good to use chitika.